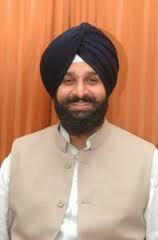 Punjab Revenue Minister Mr Bikram Singh Majithia today termed the act of Punjab Youth Congress activists to replace the photos of Punjab Chief Minister Mr. Parkash Singh Badal from the ‘108 Ambulances’ in the state as "kiddish and immature”.In a statement issued here Mr Majithia said that if Punjab Youth Congress was so keen to put photos of Prime Minister Dr. Manmohan Singh, UPA Chairperson Mrs. Sonia Gandhi and Congress General Secretary Rahul Gandhi anywhere, they should rather put them on Gas Cylinders, as they were more suitable for them. He said that by creating a political tamasha in the State, the Congress was merely creating hurdles in the smooth functioning and development of the state. Mr. Majithia said that he could aptly understand the compulsions behind these Congressmen issuing provocative and shrieking statements to deflect people’s attention from the scams of the Congress party. He said that this was a reflection of the growing frustration amongst the Congressmen, who were rejected by the people of Punjab and were already out of power because of their anti-Punjab stand. Lashing out at PYC for its cheap publicity stunt, Mr. Majithia said that the PYC should not forget that the wise electorate of Punjab had repeated the SAD-BJP government owing to its pro Punjab policies and massive development undertaken in the state. Lauding the role of Punjab Government to bring and implement the 108 Ambulance services successfully and in true spirit, Mr. Majithia said that PYC should rather choose Gas Cylinders for their leaders’ images as the whole Nation is forced to pay three times hike in its price under the rule of UPA-II. Lashing out at Congress led UPA Government for constantly ignoring the interests of Punjab by adopting discriminatory and biased attitude; Mr. Majithia dared Punjab Youth Congress to press its high command to treat Punjab equal to Rai Bareli and Amethi. He said that if Punjab is given its due than we would gladly paste the pictures of not only the Prime Minister Dr. Manmohan Singh but also the leaders of Punjab Youth Congress. The Minister said that they have no objection of putting up the photos of even Youth Congress leaders provided they bring sufficient funds for Punjab from UPA Government and increase the state’s share in Central grants to 50 percent of revenue collected from the states, which is now only 29 percent and Punjab is getting only 1.32 percent. Warning the leaders of PYC not to come with cheap publicity stunts, Mr. Majithia said that YAD would not tolerate such types of activities. He said that youth congress should also keep it in mind that they had sufficient time during the regime of Captain Amarinder Singh from 2002-07 for the development initiatives but nothing goes to their credit,which they could claim.